Let me start by mentioning this is not a paid review. It’s something I meant to do with this blog when I found good things, and I don’t think I ever got around to it. Probably because I mainly buy things like oats and milk and apples. Lots of apples. Anyway…last night AT and I felt like something sweet, because, as I have mentioned, we are back on the wagon. We’ve cut down on the bad foods and the alcohol. I haven’t bought a packet of chips for two whole weeks! So, as we all know, one of the first signs that one is back to enjoying their healthy eating routine is the craving for sweets. I have lots of chocolate in the house, it’s something I don’t eat compulsively, so it’s a mainstay. But last night chocolate wasn’t going to foot the bill. They had some chocolate puddings and cheesecakes in their range and I was intrigued by the Key Lime Pies. I picked up the box (which is very fancy) and noticed each pud was only 328 calories, which isn’t too bad. For two it was only about $6. I wouldn’t have blogged about these puddings at all if they weren’t good. I was impressed when I opened the box and pulled out two cute little glass ramekins. The serving is the perfect size and the pie was light, tangy and delicious. 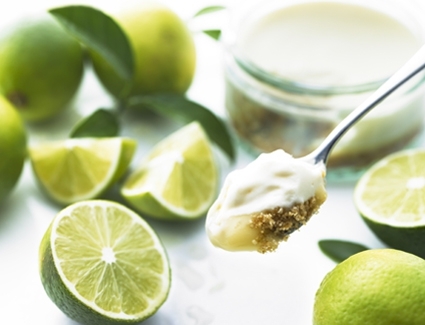 It was a light cheesecake filling on top of a tangy lime curd atop a ginger biscuit base. It didn’t feel like I was eating supermarket pudding at all. These delightful little puddings were well worth my $6 and the 328 calories. I spent $4 for 2 300 calorie chocolate mousse desserts. Cold or hot, these are awesome! They even come in glass jars with nice portions – I’m hooked!